The ratio of a lens’s focal length to its aperture size. Lower ƒ/ numbers mean that more light or thermal energy is reaching the sensor, which increases colour accuracy in visible images and increases definition and accuracy in thermal images. A type of coating applied to lens elements to maximize the performance and accuracy of the lens by reducing internal reflections. An adjustable diaphragm that controls the amount of light coming through the lens. The ratio of width to height in a video display or image sensor. An automatic adjustment to regulate and optimize the amount of light or infrared energy a camera receives. Based on the DRI standards, detection means that you will be able to see the target, however it will be little more than a spec. The target will be visible on at least two pixels, and there is a good chance that it is something of suspicion. 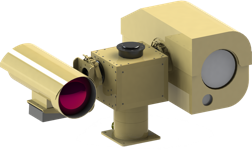 A universally accepted set of standards providing a means of measuring the effective distance of thermal infrared cameras. Detection, Recognition, and Identification (DRI) are a universally accepted set of standards used to compare the performance of thermal infrared cameras. Waves of electromagnetic energy that travel through space. Examples include radio waves, WiFi, microwaves, radiant heat, visible light, ultraviolet, x‑rays and gamma rays. The combination of all of the various frequencies of electromagnetic radiation. This includes radio waves, WiFi, microwaves, radiant heat, visible light, ultraviolet, x‑rays and gamma rays. Refers to the technology used to create an infrared image of a scene without having to “scan” the scene with a moving sensor. It is also the name of a thermal imaging camera manufacturer (FLIR Systems). Mechanical stabilization of a PTZ camera system by using the pan/tilt head to counteract movements detected by a gyroscope. Based on the DRI standards, identification of an object means that you are able to differentiate within a class of objects. For example, this person looks like a tall woman wearing a dress, that person looks like a soldier. ITAR is a United States regulation to control the export of defense and military related technologies. Some of our products fall under these regulations and may only be sold or exported if authorization from the Department of State is received. A subset of the infrared band of the electromagnetic spectrum, covering the wavelengths ranging from 8µm to 14µm (8,000 to 14,000nm). This is the radiant heat that uncooled thermal imaging cameras see. A subset of the infrared band of the electromagnetic spectrum, covering the wavelengths ranging from 3µm to 5µm (3000nm to 5000nm). This is the radiant heat that cooled thermal imaging cameras see. A subset of the infrared band of the electromagnetic spectrum, covering the wavelengths ranging from 0.7µm to 1.4µm (700 to 1400nm). Based on the DRI standards, recognition does not mean that you can recognize an individual. Recognition simply means that you are able to recognize an object’s class (is it a human or a car, truck or a tank, etc). The integration of a radar or other target detection device that tells an EO/IR surveillance PTZ camera where to point. An imager that collects visible light (400 to 700nm) and converts it to a color image that replicates normal human vision.